Egypt's Minister of Endowments Mokhtar Gomaa on Saturday inaugurated a two-day conference on reforming religious discourse, and the role of the family, the media and society in building personality. 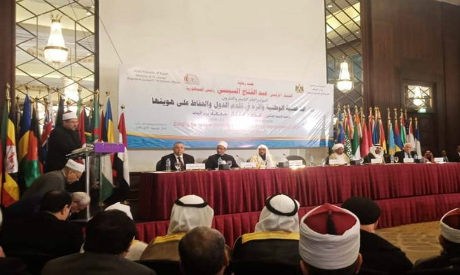 The conference is run by the Supreme Council for Islamic Affairs under the auspices of President Abdel-Fatah El-Sisi. It is titled "Building a national personality and its impact on the progress of states while maintaining its identity." Scholars from Sudan, Saudi Arabia, the UAE, and other Arab and Islamic countries are attending the conference. The attendees also include up to 150 participants from 40 countries, including 13 ministers of Islamic affairs. The participants are expected to discuss 50 research papers on the principles of religious and nationalist discourse, education and its effect on building personality. They will also discuss the role of family and media in building the personality, a strategic vision for upgrading religious discourse and how it helps enhance protection against terrorism and extremism, an Islamic vision for building the nationalist personality in a changing world, and the potentials for renewing religious discourse and its effect for protection against terrorism and extremism. Workshops and seminars will be held on the sidelines of the conference on Egypt's relations with African countries and the role of the family in the stability of societies along with means of protecting young people against extremism. Tourist and cultural tours will be organised for delegations participating in the conference.